Policies: Guaranteed vintage – return for any reason. 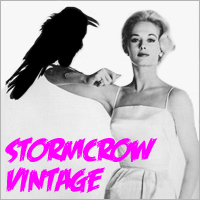 Good ol’ Stormcrow-Vintage has been one of eBay’s most consistent and trusted dealers of genuine vintage tees for the past 6 years. They broke the vintage t-shirt seller norm by allowing returns for any reason, yes, this even includes sizing. Their slick practices have earned them a flawless feedback score and near perfect DSR record, an amazing feat, especially with the recent changes to eBay’s feedback system. Stormcrow has a constant flow of vintage tees in both auction and fixed price format which usually number at least 250 at any one given time. They specialize in 1980s band shirts – all forms of rock, punk and pop. They definitely like to dabble in the dark side given their wicked selection of vintage horror film t-shirts. Their highest priced tee is a rare 1976 Stones Knebworth t-shirt at $10,000 but worry not, they run plenty of auctions that usually start at 1 cent.